Cinnamon and White Chocolate are a dynamite duo. Add Pretzels to the mix? Then you’ll see some magic really start to happen! 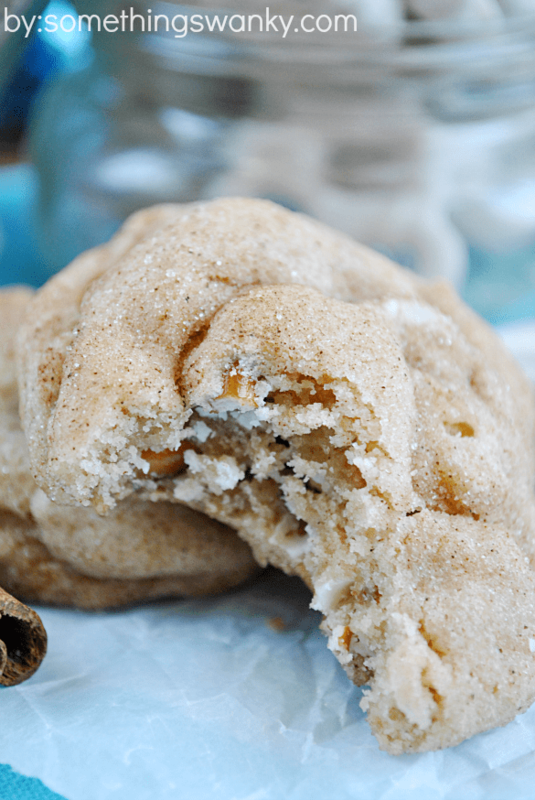 These White Chocolate Pretzel Snickerdoodles will become a cookie jar staple! I am a choc-o-late girl, through and through. But there’s just something about the combination of cinnamon sugar and white chocolate that makes my heart sing! Although, it’s my personal belief that cinnamon makes everything better, so that’s not really an objective statement ;). Seriously, though. I put it on everything. My favorite savory cinnamon food is tacos! I like to add it right into the meat and sauce (I usually make my taco meat a bit like sloppy joes). But there’s a restaurant in Utah called The Red Iguana (they were featured on Food Network! ), and I think they actually cook their tortillas with a little bit of cinnamon. It’s ah-mazing. Cinnamon and White chocolate are magic. We already said that. But adding white chocolate covered pretzels to the mix takes these Snickerdoodles to an entirely new realm of delicious! These got a big TWO THUMBS UP from my husband who’s sugar taste-buds hardly register anything anymore after so much taste testing. But he loved these, and that’s saying something! Use a stand mixer to beat together the cold* butter, brown sugar, and granulated sugar until well mixed (the butter will be chunky, not smooth yet). Add the flour and baking soda. Beat on low speed until dough forms. Add the white chocolate covered pretzels and mix for about 30 seconds until some of the pretzels are broken up. Continue to incorporate the pretzels into the dough with a wooden spoon or sturdy rubber spatula. Mix together the 1 cup sugar and t tbsp cinnamon in a small bowl. Scoop the the dough out by heaping 1 tablespoons. Roll the dough in the cinnamon sugar. For the dough into a short cylinder and place it on a parchment or silicon lined baking sheet. The base of the cylinder should be on the baking sheet (so don't place them lengthwise). 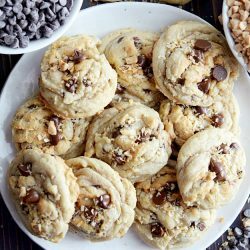 The tall-ness of the dough shape helps keep the cookies thick and not too spread out. Bake at 350 for 10-12 minutes until edges are just barely golden brown. Let cool on baking sheet for a few minutes before removing to wire rack to cool completely. *If you don’t have a stand mixer, you should use softened butter. Which means you should chill your dough for about 30 minutes before baking. I’ve never seen a snickeredoodle cookie with mix-ins. 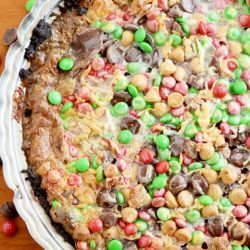 This looks so good and livens up the cookie, although I like it just as it is, too! Yummy! – Congrats on your new cookbook! OMG Ashton. These are fabulous. Cinnamon in taco meat? I might have to try that! OMG, love! So many fantastic flavors all together. What a fabulous combo! i LOVE cinnamon, and these look just fantastic. And for the record, i am in love LOVE with Red Iguana. That’s some good eats! I think 1 cup of cinnamon must be a misprint. That is wayyyy more cinnamon than anything I could imagine. Yep, should be fixed now! What a great combination!!! This would be good for popcorn! I’ve been inspired! Cinnamon with tacos! I have never tried that but I will be next time. Cool. Ok, these sound so amazing!! I’m wishing I had one or two right now. :) And thanks for the link love! I’ve actually never done the cinnamon-white-chocolate combo but you totally sold me on it! I really want to make these, but I’m not understanding Step 6. Please clarify. 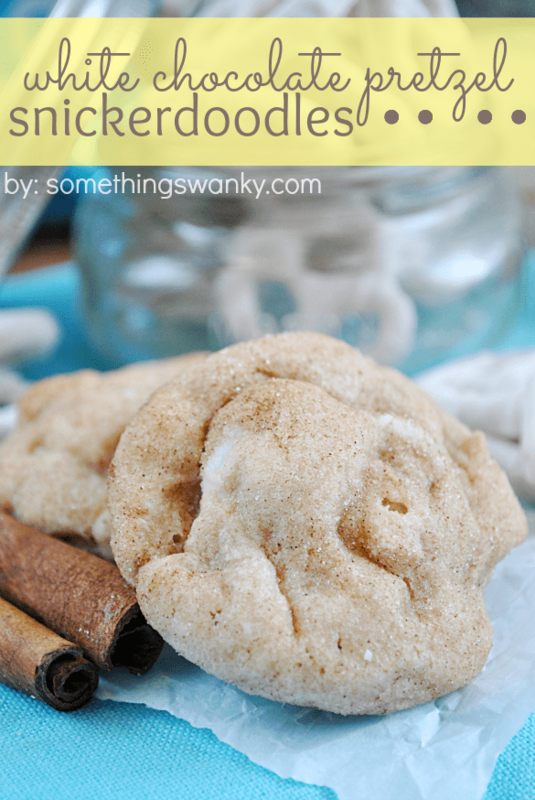 I’ve never made snickerdoodles, but white chocolate pretzels and cinnamon does sound amaazing! Yes, yes, yes! I live for snickerdoodles. Nothing beats that plush, chewy, cinnamon-y bite. And the fact that you added pretzels to them is totally awesome. Please add me to your e-mail database. Gotta love a puffy cinnamon cookie stuffed with white chocolate pretzels…they look awesome!!! 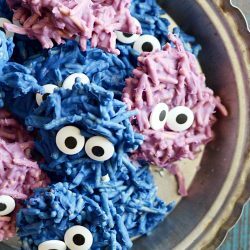 I baked these cookies last week, and they were SOOO. GOOOOOOOd. The entire batch didn’t even last 24 hours! So super delicious! Looking forward to trying more of your recipes (I discovered this recipe via Pinterest. Just thought I’d let you know!) They were so good, I had to include them in a recent post; http://fancythatnotion.blogspot.com/2013/06/silhouette-project-potluck-sign.html Have a lovely day!!! I live in a dorm at a university and my friends love when I find new cookies to bake. These were AMAZING. The recipe did not yield as many as I thought so I will probably either make two batches or make the cookies smaller. I had never used cold butter (as opposed to room temp/melted) so I wasn’t sure how they would come out but the entire dough ended up coming together perfectly. I will definitely be using this recipe again!